It’s Saturday morning and I arrive early to set up the video camera to record the RGS Galloping Geese move onto the Turn-Table to start their parade around the track. The crowds were amazing so I was sure glad to have my VIP pass to get in Cab Rides and not be stuck way back in line. I would take Cab Rides in #1, #4, #5, and #7 around the loop and it #2 on the side track. Since #6 was also on the side track and I took a wonderful Cab Ride in #6 in 2010 I skip #6 this round. Galloping Geese will be waddling around the track of the Colorado Railroad Museum for Goose Fest. Goose Fest features rides throughout the day on select geese. This gaggle of “geese” showcases the “Galloping Goose” Museum exhibit highlighting all the historic details of these unusual rail vehicles. Our Depot General Store has a great selection of Goose merchandise on hand and Mother Goose will join us Sunday for story time. The Galloping Geese are a series of seven railcars that ran on the Rio Grande Southern (RGS) Railroad from 1931–1952. They helped accommodate travel by rail in the remote and isolated regions of far southwestern Colorado. They traveled a stretch of rail over 160 miles long that ran from the town of Ridgway, Colorado on the north to Durango, Colorado on the south. The RGS called these unusual vehicles Motors, using them as less expensive alternatives to operating steam engines. The Geese retained the automobile engines and bodies from the original cars, mounted over a frame that included attached cargo boxes. They get the unique name “Galloping Goose” because the uneven railroad track made them “waddle” when they traveled. Also, the air horn sounded more like a “quack” compared to the regular steam locomotive whistle. Lastly, the Goose was run with its hoods flared open to facilitate greater engine cooling and looked like a goose straining for airspeed. This was necessary because the altitude made the water boil off quickly. The geese would frequently stop at water towers along the way to “take a drink” and fill up their water tanks. 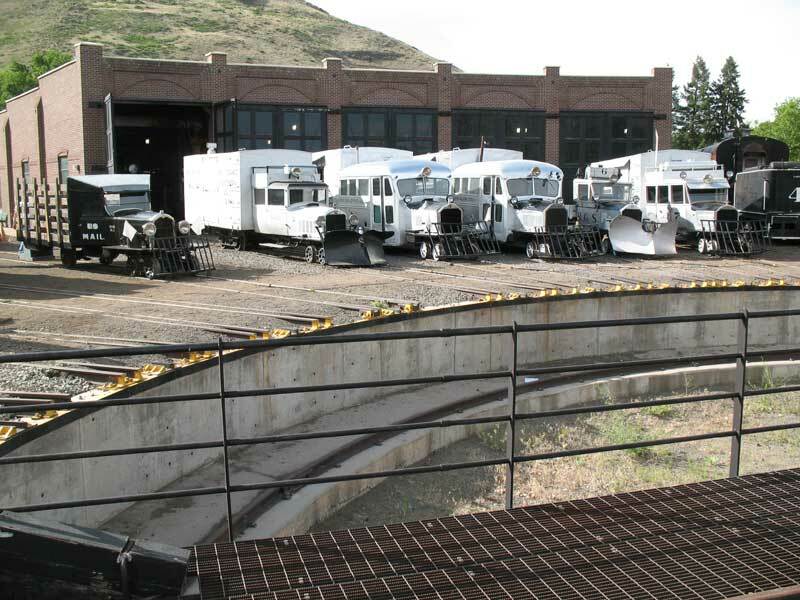 The Colorado Railroad Museum owns Geese No. 2, 6, and 7; the Galloping Goose Historical Society in Dolores, Colorado owns No. 5; the City of Telluride, Colorado owns No. 4 (which has just been restored back to service) and Karl Schaffer, from Ridgway, Colorado has built a replica of No. 1. 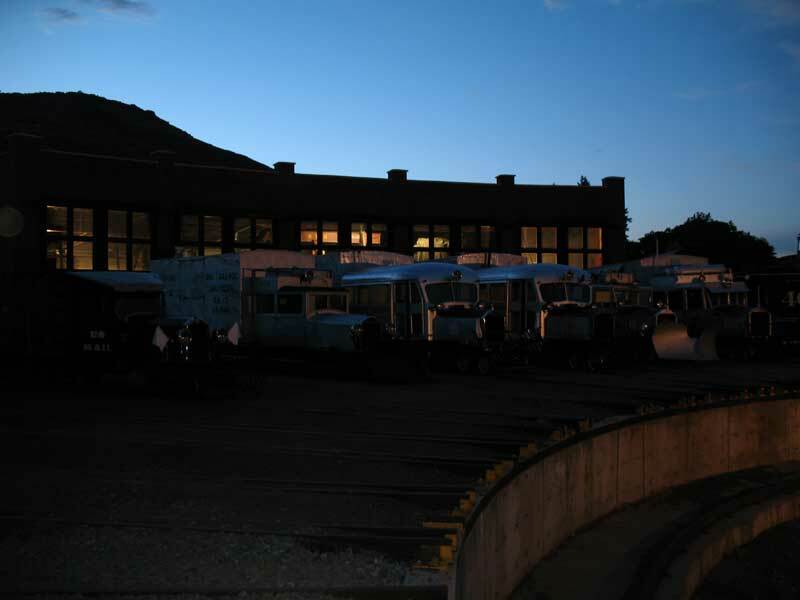 After an exciting day of taking Cab Rides and taking tons of Video and Still photographs of them running around the track the museum closes to the public and the geese are put back to bed at the Roundhouse. Our day though is not over, it’s time for our Formal Dinner so back to the UP Diner car we go to have what else for dinner, Goose! Donald Tallman (Executive Director) will server all our meals; what a host!!!!!!! For the past three days as part of a VIP package I have been at the Colorado Railroad Museum for a special fund-raising event know as Goose Fest which highlights the Rio Grande Southern (RGS) Galloping Geese. On Day #1 (Friday) I took advantage of not only coming to see the famous engines together for the first time but to also take in the museum as a whole. There is also a wonderful Library here and if you need information on Narrow Gauge railroads this is the primary facility to come to. As I get closers to retirement I too hope to help work here at the library helping to bring it into the digital age. After a wonderful day, and the museum now closed to the public, the Colorado Railroad Museum treated the VIP’s to an informal dinner in the museum giving us a chance to get to know each other. We are also treated with a showing of TIN FEATHERS, GASOLINE, AND FUMES about these historic engines. With dinner ate, we head back outside to a Night Photo session of the RGS Engine in front of the Roundhouse. My simple Point-n-Shot was not meant for this type of photography but I will run the video camera at the same time to catch this unique experience. Those with better 35mm / Digital cameras I’m sure got some wonderful shots with the help of strobe lights that were setup for this photography special. From there we head to Strasburg in Arapahoe County. Our primary stop here is the Comanche Crossing Historical Society Museum. Lots of interesting items big and small to enjoy including the old Union Pacific Depot that was moved to this location for preservation. We also know that the old CRI&P Simla Depot from Elbert County has also been moved to just south of town and is a private home of a major Railfan in this area. Our third and final stop of this chapter of RRAdventures in Limon in Lincoln County. Here we head for the Limon Heritage Museum and Railroad Park which also include the Chicago, Rock Island, and Pacific / Union Pacific Depot along with other railroad RR equipment and historical items of this area. To our surprise we will also find Ron from the Georgetown Loop working at the museum; it was his first day and it was great chatting with him. I will also find the current UP Freight Depot just behind the museum. Looks like we will have another sunny morning so we head back into DSP&P / C&S territory. We take a different route in this time coming in via Sedalia using CO HWY 67 to reach South Platte River Road. From there we turn north towards the ghost-town of South Platte. Before reaching South Platte, we come across where Nighthank, CO use stood and the railroad did have a spur up to here in 1904; abandon 1916. At this point we will be traveling on the old DSP&P ROW. I will take lots of photos and Point-n-Shoot video clips to capture the ROW which is mostly still as it was; now just a dirt road. We now reach South Platte, CO where the only part of town that still survives is the old hotel. From old photographs we can easily spot where the depot once stood. as is was across the street/track from the hotel. We will also hike a section of the old ROW that is a rail trail but only a shot distance this trip. From here we head towards Foxton, Argyle, Ferndale, and on into Buffalo Creek. We take photos along this stretch to catch other RR related items for our history research and detailed trip reports. Once in Buffalo Creek we will find the old Section House that has been somewhat modified. We will also find where the depot here once stood base on historical photos and buildings that still stand today. I will also stop again in Pine Grove to get shots of the old RR cabins I took in the pouring rain the day before. From there we head on into Bailey, CO for lunch but our research also tells us an old railroad bridge was moved there to a park and slightly altered to be a foot bridge. As we pull into town I spot it and we will also find a C&S Caboose near by. I might also have found an old RR Wait Station but that is not yet confirmed next to the caboose. Time to eat and I will take Lisa to a historical place that nearly was lost but survived by getting moved to Bailey, CO. It can be a wait to get your food but it’s worth the time. As we head down the other side we locate FR 248.1 which is important for a future trip to get deeper into Argentine Central RR territory but will be some serious 4×4 driving to get to where we need to go for that trip. As we get to the other end of the pass we come into Georgetown, CO. If you are a Railfan like us you know this is Georgetown Loop territory. One thing that has always bothered me is where was the ROW below the loop. I took this quick shot near 39.7036° / -105.7001° as this is where the ROW below the loop gets cut off by the road. Where in the heck did it go from here and get to the depot in town that is still in it’s original location was still a mystery. Well today’s stop in Georgetown is not RR related but to visit the Energy Museum which is an old Hydroelectric plat that has been in operation since 1900. It s fun/short/FREE stop and what to my surprise I find photos that show railroad ROW in it. One of the gentlemen there could not solve 100% of my mystery but certain clear up the ROW picture for me. See the ROW went behind the plant and not into town. From there is stayed along the mountain side until it reach either a Switch or a Wye that the train would use to go back into down to the station. So, train traffic heading out of Denver towards Silver Plume that would stop in Georgetown would take this siding heading into the depot and then had to backup to the mainline. Coming down towards Denver the train would pass through Georgetown and the backup to the station via the siding and then pull forward to Denver from there. Now that makes a whole lot of since knowing layout of town. Exactly where the Switch/Wye was is not 100% certain but now I have knowledge to work from. Also from behind the Hydro plant you can still see the ROW!!!!!! !